“All corruptible things: Geoffrey Hill’s Etymological Crux” in Modern Philology 112.3 (2015) : 522-553 [link to self-archive copy]. In this article I trace out some ways in which the intellectual and theological traditions of etymological study have shaped central, persistent difficulties in Hill’s poetry and poetics. One reason the piece is as long as it is is that these are true difficulties for Hill, and at times intractable. His working out of these cruxes, in poetry and prose, involves first a process of working them in. 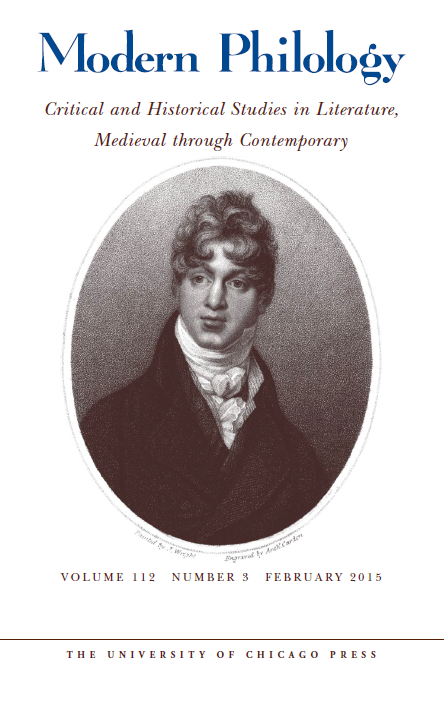 In my discussion I touch on medieval Jewish and Christian uses of etymology, but most of the focus is on Hill’s engagement with Milton, Coleridge, and Hopkins. There is also some discussion of Eliot, Donne, Blake, and Pavese. Important words that receive attention include: actuality/reality, anacolouthon, arbitrary, atonement, become, be/is (to be), cant, case, crux, fable, métier, solving/solution, and un-/un-re-. “Method as Tautology in the Digital Humanities” in Literary and Linguistic Computing (advance access, Nov 30, 2013) [link to abstract]. In this article I develop a concept of method in computer assisted literary criticism, using some my recent work with the OED and poetry. The article is both a case study describing my work modelling allusion, influence, and intertextuality, and also—and more to the point—a reflection on the intellectual activities of modelling and method-making, and their relationship to the humanistic research questions that give rise to them. In “Method as Tautology” I develop a series of metaphors to think about the relationships among researcher, research question, research object, and digital method, and the relation of these to the disciplinary concerns of literary criticism. Along the way I discuss the “discipline” of DH, its inter-disciplinarity, and how it might relate to other disciplines, and relate them together. In this article I discuss what happens when a certain type of word–one which has two meanings that contradict each other–occurs in a poem. The paradigmatic such word in English is cleave, which means both “split” and “join” (and so figures its own split meaning, the two opposite senses joined within it). I discuss this and other words, and their implications for reading, in a small selection of poems by Dickinson, Heaney, Plath, Hill, and Rosenberg. Shakespeare and Crashaw and Keats are in there, and so are Empson, Derrida, Hillis Miller, Plato, Freud, and the KJV. In this book I think about the tradition of poetic defence, or apologia, as it has been pursued and developed by three of the twentieth century’s leading poet-critics. I start with with an extended introduction to philosophical debates over the ethical value of literature from Plato to Levinas and continues by situating these three poets as in one sense historically continuous with the defences of Horace, Sidney, Coleridge, and Shelley, but also as drastically other. This otherness is bounded on one side by the example of T. S. Eliot’s career-long contemplation of the ideal of poetic ‘integrity’, and on the other by a collective recognition of the twentieth century’s great horrors, which seem to corrode all associations of art and the good. I then go on to argue, via close readings of the poems and prose essays of Brodsky, Heaney, and Hill, that any ethics of literature ought to take into account not only poetry, but also the writings of poets on the value of poetry. 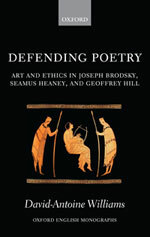 Defending Poetry has been reviewed in The Times Literary Supplement, Essays in Criticism, Christianity & Literature, The Heythrop Journal, The Year’s Work in English Studies, American Literary Scholarship, Routledge Annotated Bibliography of English Studies. The book has been cited in Helen Small, The Value of the Humanities (OUP, 2013); F. L. Aldama, Formal Matters in Contemporary Latino Poetry (Palgrave: 2013); S. Khagi, Silence and the Rest: Verbal Skepticism in Russian Poetry (Northwestern UP: 2013); C. Bugan, Seamus Heaney and East European Poetry in Translation (Legenda: 2013); A. Hassan, Annotations to Geoffrey Hill’s Speech! Speech! (Glossator: 2012); P. Pennington, in The Oxford Handbook of Contemporary British and Irish Poetry (OUP: 2013); and S. Ang, in Texas Studies in Literature & Language (2013). ‘Tête-à-tête, Face-à-face: Brodsky, Levinas, and the Ethics of Poetry’ in Poetics Today 30.2 (Summer 2009). 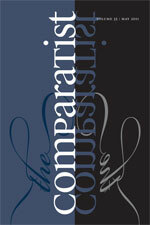 [link to journal issue] (institutional subscription req’d); [link to self-archive copy] (free). Probably this was my first “good” publication. In the article I tried to place Emmanuel Levinas’s writings alongside Joseph Brodsky’s critical prose. It occurred to me that, like Levinas’s radical commitment to the other, Brodsky’s radical commitment to poetry—what Seamus Heaney called his ‘peremptory trust in words’—was set at a similar theoretical distance from the idea that the didactic, the deontological, or the political may be constitutive of ethics. I didn’t mind admitting from the outset that Brodsky’s maxim, ‘aesthetics is the mother of ethics’, is inimical to Levinas’s project—which is to establish ethics as the mother of philosophy, as it were. The rapprochement attempted here was never intended to be final in any sense. Instead, in collocating Levinasian reflection on encounter, the originary, and the face-à-face with Brodsky’s writings on poetry as a ‘tête-à-tête relation’, I wanted to give philosophical substance to Brodsky’s musings on the ethics of aesthetic encounter while simultaneously demonstrating one way Levinas can inform literary criticism. Along the way I was able to make a correction to current convention in English-language writing on Levinas, suggesting what I think is a preferable set of terms (because more accurate, more precise, and yet simpler) to render his several ways of designating self and other: Autrui, autre/Autre, moi/Moi.